Pizza is an oven-baked, flat, round bread typically topped with a tomato sauce, cheese and various toppings. Originating in Italy, the dish has become popular in many parts of the world. 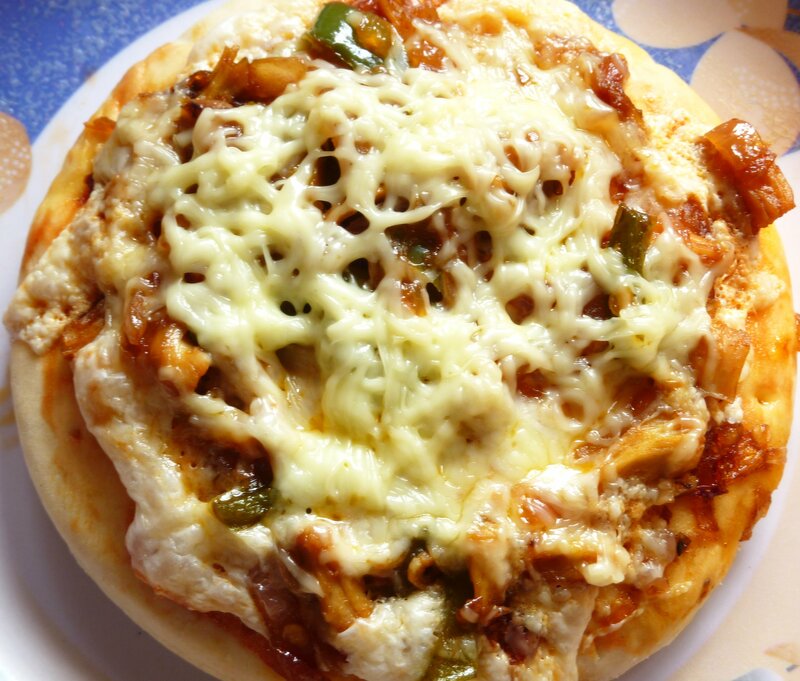 This recipe is for Chicken pizza which has a topping made of chicken, capsicum, tomato sauce, soya sauce, vinegar and cheese. Boil chicken with salt and pepper and then shred it in small pieces. Keep aside. Heat olive oil in a pan and add the onions and garlic, sautÃ© till they turn pinkish and then add the capsicum and sautÃ© for 3 minutes. Now add soya sauce, vinegar and tomato sauce and mix well. Finally, add the chicken pieces and sautÃ© for 2 minutes. Your mix is ready. Now take a pizza base and apply a little tomato sauce on it. put cheese strips of one cheese slice and then spread the chicken topping over it and lastly spread grated pizza cheese on top of it. Preheat the oven at 180 degree centigrade. Put the pizza base in the oven and microwave it for 1 minute 30 secs (by then the cheese will melt). Serve hot with tomato sauce.